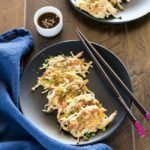 Korean enoki mushroom pancakes (Paeng-ee beoseot jeon, 팽이버섯전) are a perfect side dish for a mushroom lover! They are loaded with savoury flavour and crisp texture and are really easy to make! 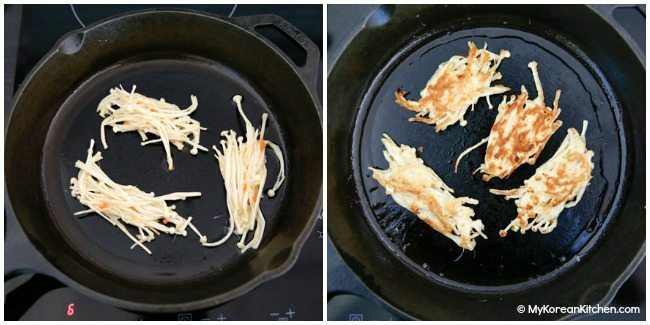 I originally shared this enoki pancakes recipe back in 2006 when I was living in Korea, where mushrooms are abundant and very cheap. In those days, I used to buy 500g /1 pound of enoki mushrooms for US $1! It sounds crazy cheap, doesn’t it? 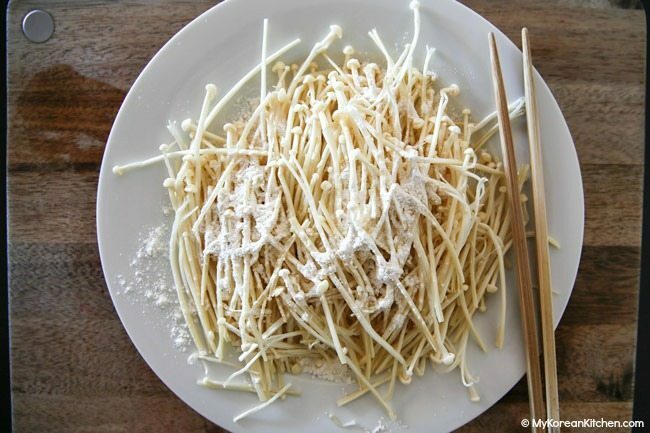 Typically enoki mushrooms are added in soups and in stir fry dishes, but turning them into a bite sized pancakes / mushroom omelettes / mushroom patties / mushroom fritters, whatever you would like to call, is also very popular in Korea. It makes an easy banchan (side dishes) that everyone will like. And even more importantly, my daughter loves these! Anyway, they are very easy and simple to make! And it gives you a similar sensation of chewing some types of meat, so it can be a good vegetarian food. 🙂 I hope you enjoy them too! 1.Roughly separate the main cluster of the enoki mushrooms. Place them onto a large clean plate and sprinkle the flour and sesame oil onto the mushrooms. Then roll the mushrooms around using chopsticks to coat the flour and sesame oil on its surface thoroughly. 2. Combine the beaten eggs, chopped vegetables, salt and black pepper in a mixing bowl then mix them well. Add the flour coated enoki mushrooms into the bowl and soak up the seasoned egg and vegetable mixture. 3. Pre-heat a pan / skillet over medium heat. Once heated, add the cooking oil and spread it thinly. 4. 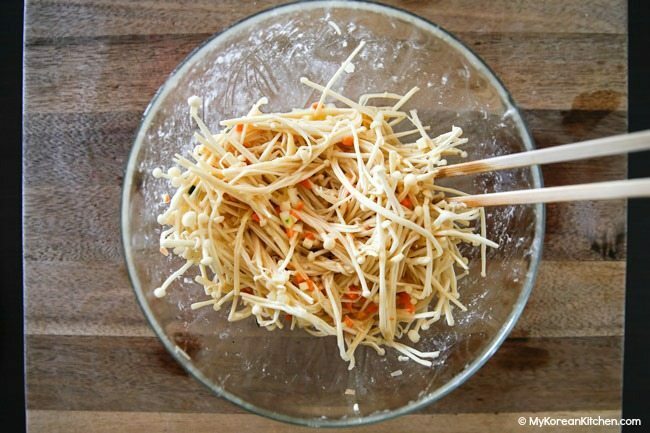 Scoop out spoonfuls of the enoki mushrooms mixture using chopsticks or spoon, whichever is easier for you. (Make sure to mix the egg and vegetables mixture onto the mushrooms often to evenly use it up.) Cook the mushrooms until they turn brown then turn them over. When both sides are cooked, remove from the heat. 5. Repeat the step 4 with the remaining ingredients. (Make sure you add some cooking oil between the batches to avoid them burning). It should result in about 20 small sized pancakes. Roughly separate the main cluster of the enoki mushrooms. Place them onto a large clean plate and sprinkle the flour and sesame oil onto the mushrooms. Then roll the mushrooms around using chopsticks to coat the flour and sesame oil on its surface thoroughly. Combine the beaten eggs, chopped vegetables, salt and black pepper in a mixing bowl then mix them well. Add the flour coated enoki mushrooms into the bowl and soak up the seasoned egg and vegetable mixture. Pre-heat a pan / skillet over medium heat. Once heated, add the cooking oil and spread it thinly. 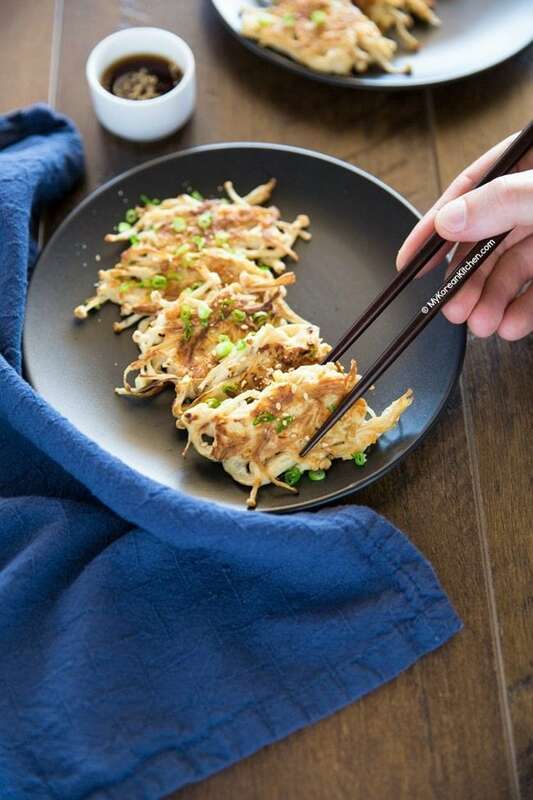 Scoop out spoonfuls of the enoki mushrooms mixture using chopsticks or spoon, whichever is easier for you. (Make sure to mix the egg and vegetables mixture onto the mushrooms often to evenly use it up.) Cook the mushrooms until they turn brown then turn them over. When both sides are cooked, remove from the heat. Repeat the step 4 with the remaining ingredients. (Make sure you add some cooking oil between the batches to avoid burn). It should result in about 20 small sized pancakes. 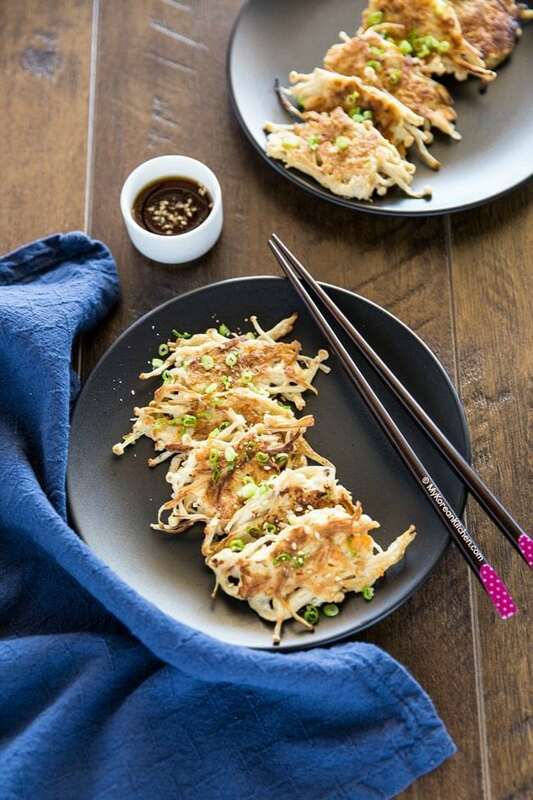 No matter what I try, I’ve never been able to enjoy enoki mushrooms, but these pancakes are divine! Already I’m trying to justify eating the entire batch so I can go buy more mushrooms. I don’t think I’ve ever posted a comment in response to a recipe, but this deserves one! These were SO delicious and I was able to throw them together with leftover enokis and all the usual veggies/ingredients we keep in the kitchen – no special shopping trip. Thank you for sharing this recipe, I will definitely make these again! These are sooo delicious…my favourite breakfast! I have made these so many times now that I know the recipe by heart (along with the dipping sauce). Thanks for a great recipe! I made these pancakes today, they are amazing!! Hello! I love this recipe, and was wondering can I save the batter for later use? It should I cook them all then re-heat them? Hi Sameena, I think cooking this recipe batter later might not work well. 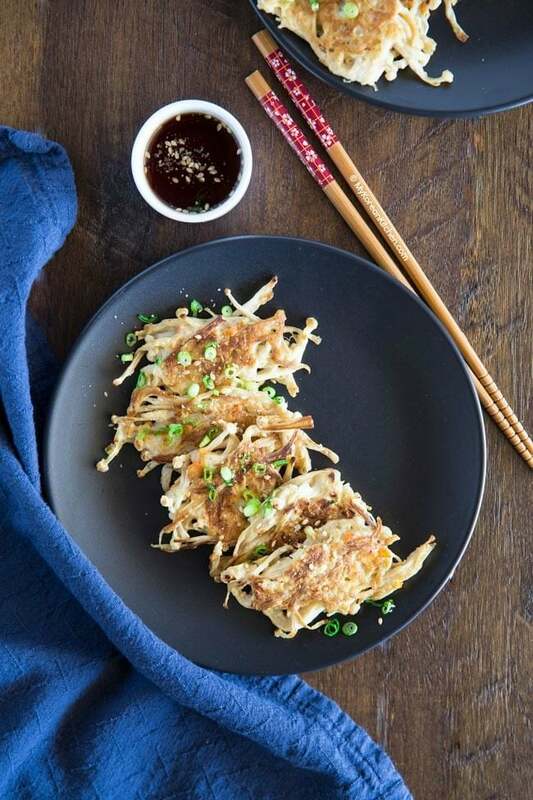 It normally works fine for other Korean pancakes, but this recipe is a bit differently prepared. So, I would cook these ahead and reheat as needed. I’ve done this before and it came out fine. Hope this helps! as described easy and delicious – will make again for sure!!! These were wonderful. The Sweet Tangy Soy Dipping Sauce complemented them very well. I added an extra 1/2 tsp of red pepper flakes and 2 red chilies and the spiciness was spot on. 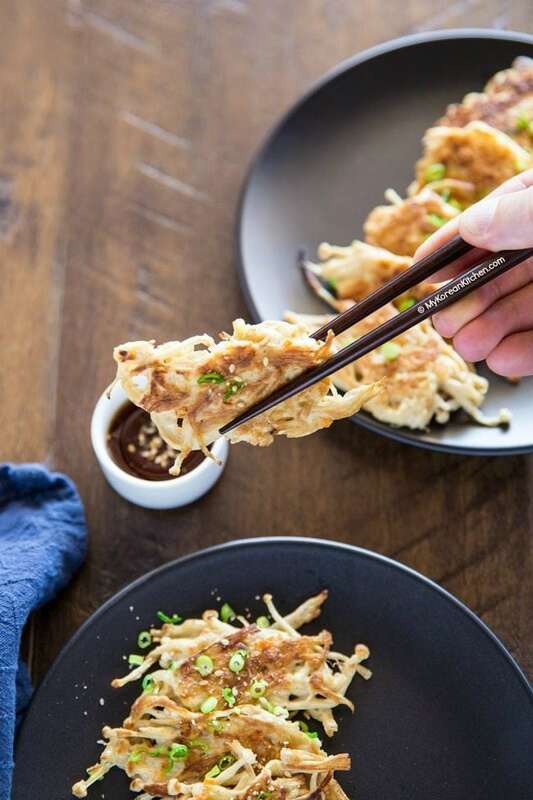 What a lovely idea to use Enoki mushrooms in pan-frying! We use to fry oyster mushrooms with batter. This one is a worth trying idea. Thanks for sharing, Sue! I’m in the UK so I m not sure what all-purpose flouris. Can I use any flour? Apart from speciality flour, ours is Plain or Self Raising. Hi Denny, Plain flour should be OK! (I think all purpose means the same thing.) I wouldn’t use self raising. Rice flour is OK too. 🙂 Enjoy! I just made this today – with some minor modifications since I didn’t have all the ingredients. I had an extra pack of enokis and I didn’t want to eat them in soup. I ended up doubling the recipe – my pack of mushrooms was big. This was really nice. My mom use to do something similar with bean sprouts, but I like the mushrooms a lot more. I did this to get rid of my enoki pack, but I’m probably going to go out and buy more just to make this again. I made this dish the night before last. Wow! what a great recipe. I always thought these were so hard to make, on the contrary. This is such an easy recipe and so relaxing to make. I didn’t have flour, but I make almond flour and it didn’t mess up the flavor at all. Very soothing to the soul (Seoul) – like a good bowl of chicken soup. I’m glad to hear you enjoyed this dish so much. Thanks for letting me know that it worked with almond flour just as well. I’m sure my readers will appreciate this information some day. 🙂 I’ve got to make this myself soon as I haven’t made it for many years! I guess it is similar, but this one will have a unique texture from the mushrooms. A bit chewy. I often fall into the temptation of buying a food item because it is cheap too. So I do my best to plan my weekly menu before I go supermarketing but *sigh* that doesn’t work all the time.